My great-uncle Dominic, one of the inspirations for “Grandpa Butch” in Blade of Dishonor, and one of the men to whom I dedicated the book, passed away this month in his sleep. His son Richie, a Vietnam veteran, held a memorial to his departed father this Sunday. 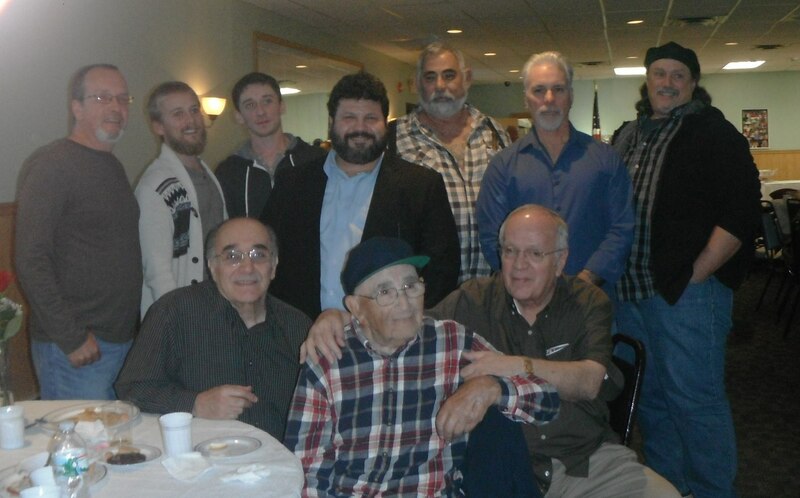 Family and friends filled the VFW hall in Nutley, where Uncle Butch sang karaoke, just a few weeks prior. Uncle Butchie, as we called him, was an unforgettable character. Six feet tall, sporting a Stetson and a handlebar mustache that would make him the envy of every hipster this side of Portlandia, he also possessed a booming voice and a bottomless collection of jokes and yarns, usually just slightly off color. His favorite involved adultery, a refrigerator, and a Volkswagen. He was a man of great heart. I still remember his New Year’s Eve parties. Dancing with Aunt Josie to Hank Williams. At his memorial this Sunday, two mellifluously voiced bikers sang “Your Cheatin’ Heart” in his honor. And shortly after, “Taps” was played, to send off the old soldier. Dominic served in World War II. Some of his training was done in the South. Maybe that’s where he picked up the hat he wore for years, and his manner of speech. He didn’t have a New Jersey accent. He was full-blood Italian, but always looked and sounded like he walked out of a John Wayne picture. Though he did roofing and plumbing, and drove a white Town Car a mile long, you wouldn’t have doubted it, if someone said he had a cattle ranch and had just roped a steer. Much of the family gathered for the memorial, including his brother Jimmy. The last of his brother and sisters. As they say, these events are for the living. To set in our minds the man who left us, and remind us of those we still have. I was honored when my cousin Corey, Uncle Dominic’s granddaughter, asked to use my dedication for part of the photo memorial, including the photos of uncles Dominic and Jimmy at the book premiere. Here it is. You can read the full dedication here. He will not be forgotten. He touched so many lives, helped so many around him. He danced and sang until the week he died, well into his nineties. He was steadfast and loyal but always had time for a good laugh. A good example for all of us. And here’s that joke. I wish I could tell it like he could. Three men are in line at the Pearly Gates before St. Peter. Like I said… if Uncle Butchie told it, you’d be laughing. I’ll miss you, Uncle Butchie. Thank you for being the man you were. Here’s some of my family and me, at the memorial. 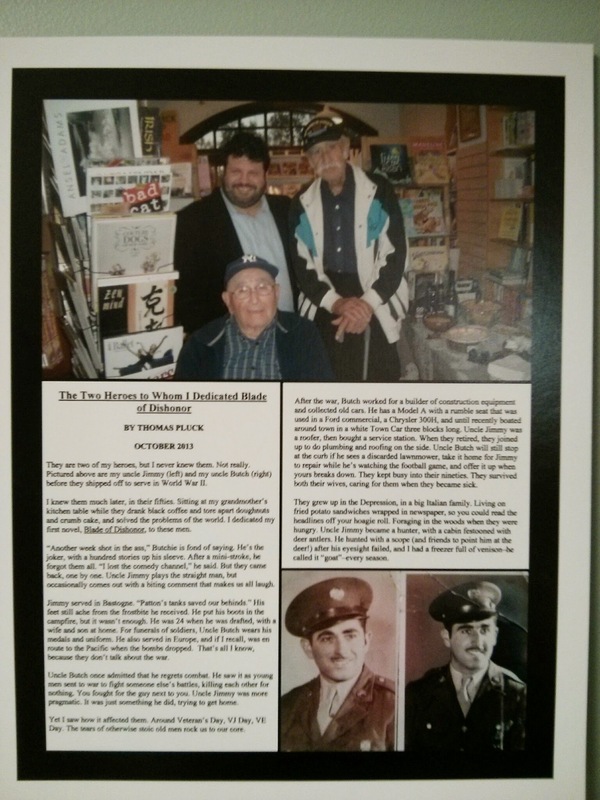 Great Uncle Jimmy in front, my Uncle Paul to the right (he’s getting the next book dedicated to him!) and my cousins lined up behind. Richie, Butch’s son, is to the right of me. I’m sorry to hear that. I’m glad I got to meet him at the reading.